* Titles and affiliations are as of the time of the conference. Through participation in educational reform in high schools and universities and also reform for connecting high-school and university education, I formed the opinion that the essence of the topics covered in these educational reforms are inseparable from nurturing social and emotional skills. I would like to discuss this by incorporating research findings from cognitive science, which is my area of specialty. The first one is "Living with autonomy." They will have to set their own goals and continue learning to achieve them in order to make confident decisions on issues with complicated factors and be able to resolve issues which lack definite solutions. The second and third ones are "Living with diversity" and "Living in cooperation," which are essential for working and studying with people from different cultural backgrounds. Those include the imagination to empathize with others, the ability to express one's feelings, improvisational decision-making skills, concurrent processing skills, and team-working skills. Imagination and the ability to express oneself are the basis of communication and decision-making skills can be positioned as the driving force to deal with new issues which were nonexistent in the past. As the issues become more complicated, concurrent processing skills and team-working skills will become essential skills in order that different issues can be dealt with at the same time. The fourth one is "Living with gratitude." In general, this would be gratitude toward other people, but for Japanese children, gratitude for themselves would also be appropriate. The fifth one is "Being proud of others." This is about being proud of one's parents, teachers, other people, and oneself. These five qualities and abilities are inseparable from the development of social and emotional skills. Children can acquire and improve them as they grow up but support from adults is also extremely important. Next, I would like to discuss the adult requirement. According to research in cognitive science, social and emotional skills are built up from factors such as "bonding with people who share feelings," "the existence of people who provide consistent support," "a place to come back to with a peace of mind," and "warm memories to look back on throughout one's life." Promising these things to children is the most important task for the future of Japanese education. In my case, I have vivid memories of various happy events from kindergarten which still cross my mind naturally at certain times. Although this could be due to the fact that the kindergarten teacher from that time is still working there and that we see each other occasionally, there is a more essential factor. I feel that my starting point as a person was the time I was in kindergarten. I believe this is the reason why those warm memories remain in my mind and come back to me from time to time. Everyone has the ability to set new goals by themselves and to work towards achieving them. Children in the process of growing up must be supported by adults in order to develop such abilities to the full. Within the conventional education in Japan up until now, which gives weight to cultivating cognitive skills, efficient and systematic group teaching of knowledge and skills has been the core. However, as cultivation of social and emotional skills are becoming more important these days, establishing an educational setting where children can enjoy learning proactively will be indispensable. Such efforts are being made in progressive schools, mainly in elementary and junior high schools. In this municipal elementary school in Hino City, Tokyo, for example, individual learning and collaborative learning are actively introduced under the tagline of "From passive learning to active and creative learning," giving more opportunities for children to think individually. On the other hand, breaking away from the so-called fact-cramming education has not made its way as expected in high schools and later stages of education, and remains as an important issue. The fact that the style and format of university entrance exams has not changed is one of the main reasons. Therefore, the Ministry of Education, Culture, Sports, Science and Technology has started an integrated reform of high school education, university education, and entrance exams of universities that emphasizes "an attitude of proactive cooperation with a diverse cross section of people (Being proactive, multifaceted, and cooperative)" to adapt to the new era. Meanwhile, Courses of Study for kindergarten, elementary school, junior high school, and high school will be revised. The revision will aim to nurture "skills in intellection, decision making, and self-expression" by aggressively implementing "proactive and interactive deep-learning," in addition to the consistent acquisition of knowledge and skills. There is a strong correlation between the development of social and emotional skills and that of cognitive skills. Let's have a look at this through two items of research/survey data from Benesse Educational Research and Development Institute. The term "Attitudes of learning to learn" used in the data refers to "Curiosity," "Collaborative skills," "Self-restraint," "Self-assertion," and "Perseverance." It can be described as a concept included in social and emotional skills. The first is "Survey on Children's Experiences at Childcare Facility and Their Development" which was conducted among a group of around 2,000 guardians with children in the last year of kindergarten, daycare center, and Early Childhood Education and Care center (ECEC center: nintei kodomo en). 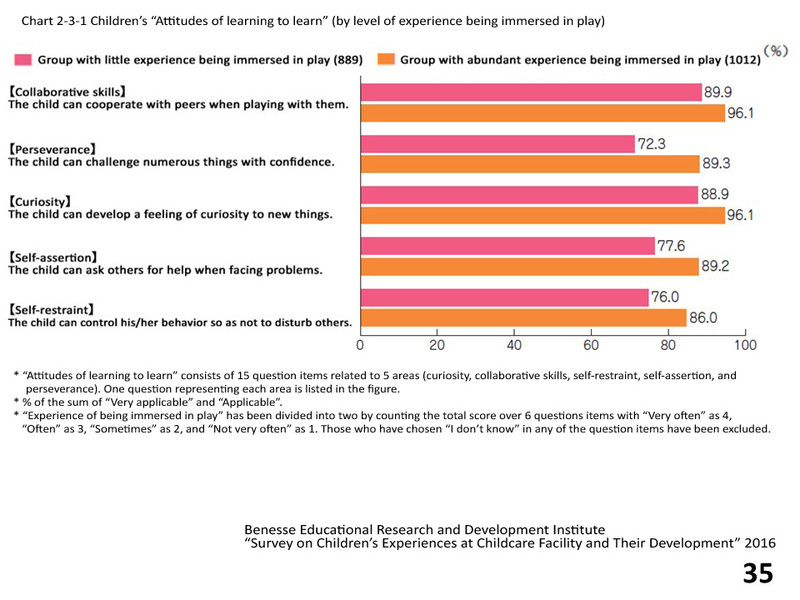 We can see that children who had more "experience being immersed in play" in early education have higher "Attitudes of learning to learn" (Fig 1). The other is "Research on Home Education from Early Childhood to First Grade of Elementary School (Longitudinal Survey)" which was carried out over a period of 5 years from 2012-2016 in order to understand the relationship between home education from early childhood to elementary school and children's growth. In this survey, "Hiragana (Japanese syllabary)/Numeracy/Logical Thinking," "Attitudes of Learning to Learn," and "Daily Habits," had been set as the 3 cores of learning in early childhood which affect learning and lifestyle in elementary school and onwards. "Hiragana (Japanese syllabary)/Numeracy/Logical Thinking" consists of "Hiragana," "Numeracy," "Language," and "Classification skills." 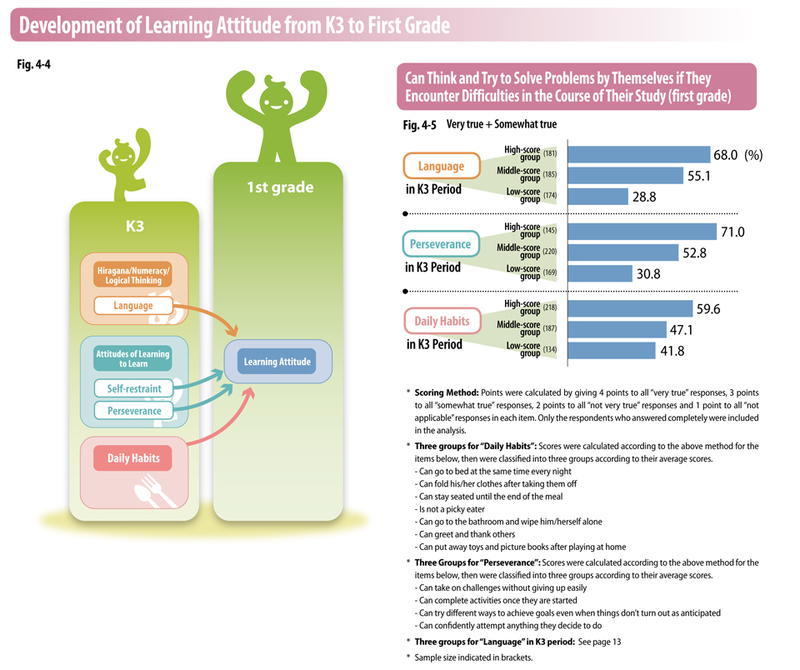 The high ratio of "Can think and try to solve problems by themselves if they encounter difficulties in the course of their study" in Grade 1 elementary school period indicates correlation with the high stability of "Language," "Perseverance," and "Daily Habits" seen in the last year of kindergarten (Fig. 2). Through these results, I believe you can understand the importance of social and emotional skills as the foundation for the development of cognitive skills. However, cognitive skills do not develop after social and emotional skills have completed their development. They develop side by side, each influencing the other. This has been proven through demonstrative research in cognitive science, developmental science, and neuroscience. For example, babies acquire language by developing various functions such as sympathy, communication, perception, physical exercise, emotion, and memory through interactions with close adults starting with their parents. Moreover, mastering language skills promotes further development of emotions. Therefore, it is vital that home and childcare facilities work closely together to support children in order to achieve a balanced development of social and emotional skills and cognitive skills. In our future society, collaborating with people with various cultural backgrounds will become extremely important. For children who will be living in such a future, social and emotional skills will be valued more than ever. Consciously supporting children from early childhood will be essential. Some might say that "Problems emerging after becoming adults and those of early childhood education do not seem to be closely related" but children's growth has no breaks in between and its education has continuity. In addition to examining early childhood education, elementary education, secondary education, and university education individually, nurturing social and emotional skills should be considered as a common theme positioned on top of all these educational stages. Yuichiro Anzai is well known for his pioneering work on learning by doing and human-robot interaction in the fields of cognitive and computer sciences. 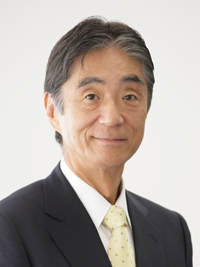 He served as the president of Keio University (2001-09), the chair of the Central Council for Education, the chair of its University Subcouncil, the chair of the Association of Pacific-Rim Universities, and others. 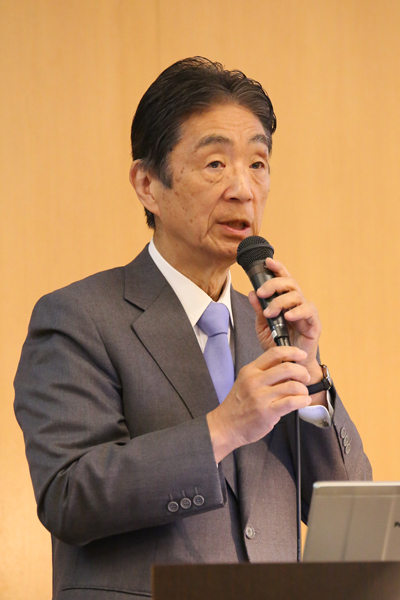 Currently he is the leader of the team in MEXT for the reform for connecting high-school and university education, and the chair of the Artificial Intelligence Technology Strategic Council. He published around 300 reviewed academic articles and books in cognitive and computer sciences, including Machine Learning and Pattern Recognition (Academic Press). Anzai received a Person of Cultural Merit, the Medal with Purple Ribbon from the Japanese government, Commandeur de l’Ordre des Palmes Académiques from France, and honorary doctoral degrees from École Centrale de Nantes and Yonsei University.